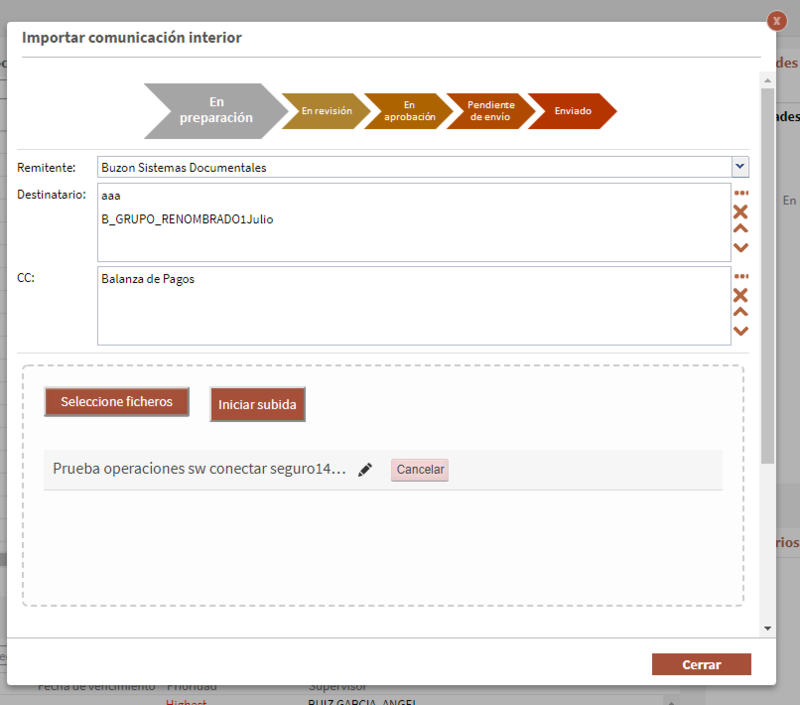 We are are working with D2 4.7 versión, and we are trying to import a document by a dialog (extends AbstractDialog implements ID2Dialog ). We have created the property file, the dialog and action java class, and the XML. We have use a file tag into the XML, to import the document, like the attached file. My question, is how can we get the file into the server, becouse in the context or D2Fcontext, we only have the path of the file (from client side, obviously). Is there a way to get the file (like a do-post method in HTML) using the dialog? I've the same problem, any solution? Thanks! I just want to be able to register a document in one step, with a dialogue that asks for a document to import and the properties. The client complains that all the steps appear on the left side (select template, linked documents ..) and that he has to go through all of them without doing anything. 2 - Choose the document's metadata and then click Next to finish. Yes, I have it. But it also goes through the rest of the steps without stopping and the client would like the steps of selecting template and linking documents not to appear because they do not understand them. AFAIK, you cannot do what you want (OOTB). You can extend the import widget changing the first step (select file), and, if you don't have templates (or there's only one that can be applied), that step can be skipped through configuration. But you cannot modify in any other way (that I know of) the importmanager. If you want to develop your own dialog, you can then implement a custom upload servlet and use that to upload documents. How can I create a custom servlet from a dialog that extends AbstractDialog implements ID2Dialog. I can not find the way to get the request from the personalized dialog. You have to create a servlet that receives a file and uploads to Documentum, this has nothing to do with the dialog, this should be a standard servlet added to D2's web.xml. Then you need to send the file to that servlet from the dialog, as you would do with any form from an html page. Thanks very much Andrés, I find it interesting... can you put html code inside the xml dialog? I have inserted html code into a custom dialog. In the dialog.xml file, an item of type comment has been added with the property html content = true and in label tag you can enter all the html code you want. To facilitate the task, the code I have entered is a borderless iframe that refers to an external html file that can receive parameters from the dialog itself and interacts with D2 through rest services. <comment height = "500px" id = "iframenexos" advancedView_enabled = "false" html_content = "true"
label_en = "& lt; iframe frameborder = '0' width = 100% height = '500px' src = 'html / importci.html? id = $ value (id)' & gt; & lt; / iframe & gt;"